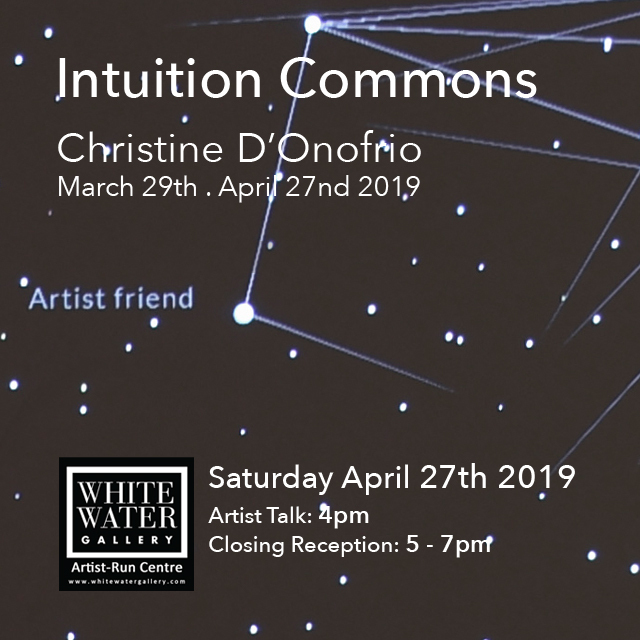 Please join us this April at the White Water Gallery for Christine D’Onofrio’s Intuition Commons from March 29th to April 27th. Perspectives, accounts, and memories may differ, and so you are encouraged to contribute your own versions, your own records, creating a rhizomatic web of links — visual connections and nuanced and overlapping stories that demonstrate the complexity of relationships we have with knowing. We will be closing the month with an artist talk by Christine D’Onofrio on April 27th at 4pm, followed by a closing reception for Intuition Commons from 5pm to 7pm.